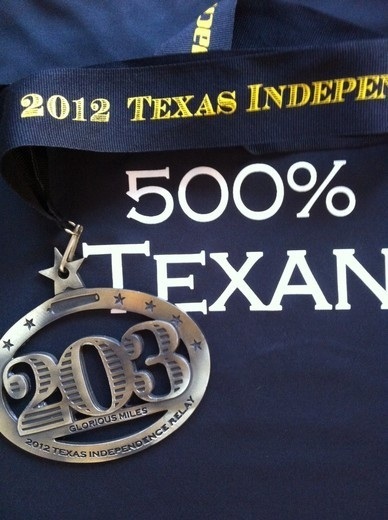 The 2012 Texas Independence Relay was very tough. It demanded perseverance, sacrifice and planning. It required caring for other teams' heat-stricken runners, overcoming sleep-deprived short tempers and running strongly despite soaring heat and high humidity. It necessitated patience and understanding when two team members (myself unfortunately included) became temporarily disoriented and lost the team valuable time. 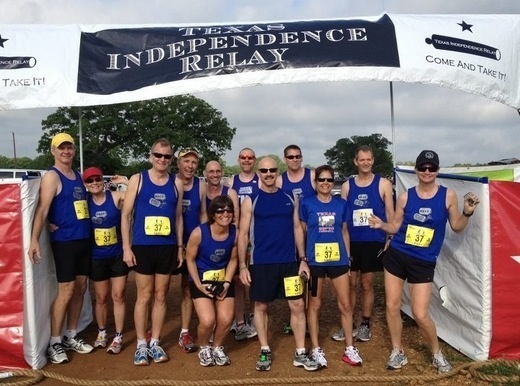 Nevertheless, in the DOGs' five year history running the Texas Independence Relay we achieved our best placed outcome thus far, second place in our Mixed Masters Division! 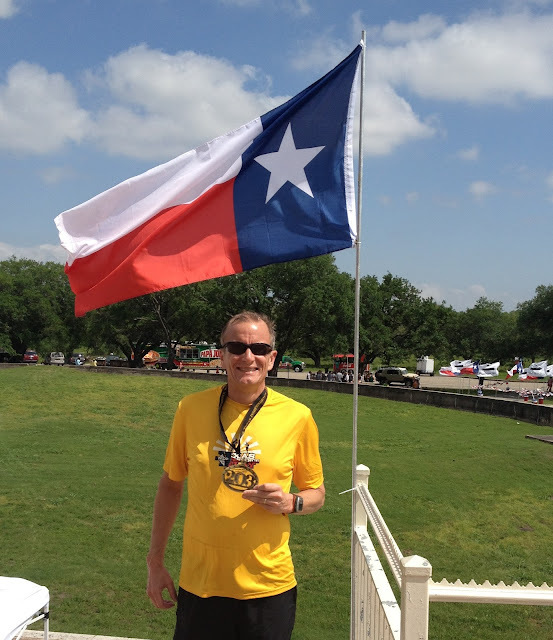 The Texas Independence Relay's unprecedented late March start was caused by the organizer's inability to obtain support from the race's historically chosen start in Gonzales. Bastrop was selected, which proved fortuitous as despite the string of calamities it has suffered in the past twelve months - unprecedented heat, record drought, unquenchable fires and a road destroying flood - it welcomed the TIR runners and amply revealed its rustic charm and beauty. I ran my first leg of 6.41 miles at a 8:22 pace. I made this leg unnecessarily tough by running the first two miles at an absolutely ridiculous 7:20 pace, insane considering the 89F temperature, dripping humidity, and baking sun reflecting off the softening black asphalt which gave the perception of 100F temperatures. Too much adrenaline and excitement turned my non-existent pacing strategy into an unintended exercise in masochism, and thus my toughest TIR leg ever. I wasn't alone in my misery. Runners dropped around us like flies, as ambulances arrived at nearly every late afternoon exchange point while paramedics rushed several other team's heat-stricken runners to the hospital. We felt sorry for the numerous inexperienced runners who were neglected by their teams and left to fend for themselves with no fluid support or assistance. While we took many unsupported runners under our wing to provide them cool fluids and a cool space to recover, we hope that in coming years these teams better attend to their runners' needs - particularly in extreme weather conditions. During our vehicle's rest shift we enjoyed a tasty baked BBQ chicken and baked potato dinner and managed an all too brief four hour sleep when we were awakened with word from our leader Paul: "We've got a wounded DOG." Startled by the news that Tim had pulled a hamstring, and that Paul had of necessity run Tim's third leg, Janet and Laura came up with a great plan. Janet would give her short two mile leg to Xabier, she would take Paul's four mile run and I would take Tim's six miler. With this sorted out I ran my 2:30 AM five miles leg at a much better 8:03 average pace. It was surreal to have my headlamp illuminating a narrow cone of light in front but otherwise enveloped by a dark shroud of total silence. With half a mile to go I saw a runner ahead, whom I made my mission to pass. With one hundred yards remaining before the exchange he heard me approaching, so we sprinted headlong towards the exchange with both teams cheering loudly. Narrowly missing passing him in the final yard I shook his hand afterward and thanked him for providing a great motivating target. At dawn on Sunday I ran my third leg of 6.8 miles with a disappointing 8:59 average pace. This was unfortunately the result of my inattention to the trail which caused me to temporarily got lost in George Bush Park, wasting five minutes asking for help. Strangely, the much lower 74F temperature was fully offset by the still early morning air and the 100% humidity, so the combination actually felt hotter than the final leg run in the late afternoon's heat. I ran the remainder of the leg with Dave, a first-time TIR runner from Austin. He shocked me by indicating that on Saturday afternoon he had literally counted ten separate runners picked-up by paramedics owing to the heat. I have no idea if Dave's count was accurate, but regardless it occurred that similar to what the organizers of the Houston and Chicago Marathons have implemented with posted heat advisory notices that the TIR organizer should similarly consider post written notices under adverse conditions. This might be done inexpensively and effectively at the exchange points; under hot conditions such sheets would caution runners of the symptoms of heat exhaustion, heat stroke and hyponatremia, and remind them of their simple preventative measures. Finally, on Sunday's early afternoon I ran a tough 6.04 mile leg with a very good 8:05 pace. I'm glad I had volunteered to take Tim's final leg, as it proved my best. Despite 86F temperatures, a 74F dew point and a strong sun the combination of a wonderfully supportive team providing ample cold water and Gatorade along the route every mile, a gentle breeze, the privileged feeling from the Pasadena police blocking major street intersections upon my arrival, and the knowledge that this was my final leg allowed me to give it my all. The DOGS successfully overcame the many obstacles we faced and we achieved our highest Mixed Masters Division ranking of second place with a time of 28:59, an 8:34 overall average pace over the 203 mile course. This result was noteworthy in that we had narrowly beaten the third place team in our Division by only seven minutes, a mere 0.4%, or just two seconds per mile! Thanks to team DOGs for another great race - the team's fifth successful year!! Afterward, relaxing with the team at the Monument, my friend Carsten kindly took a great picture which revealed just how happy I was after our challenging yet rewarding race.